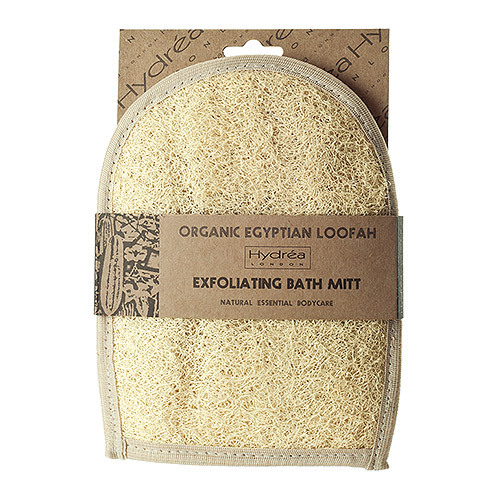 Hydrea London Organic Egyptian Loofah Mitt. This luxury loofah mitt consists of high quality natural fibres that are perfect for cleansing and exfoliating the body. The perfect spa tool for achieving smoother, radiant skin. Use in the bath or shower with your favourite cleansing product. Wet the loofah and massage in circular movements towards the heart. After use, rinse thoroughly with cool water and leave to dry naturally using the hanging loop. The cotton back is ideal for gentle washing. Below are reviews of Organic Egyptian Loofah Mitt backed in Egyptian Cotton by bodykind customers. If you have tried this product we'd love to hear what you think so please leave a review. Great item. Loofah side is perfect for exfoliating skin before washing with the cloth side, to feel squeaky clean. 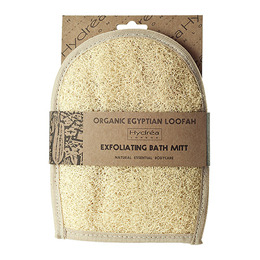 Hydrea London Organic Egyptian Loofah Mitt.This luxury loofah mitt consists of high quality natural fibres that are perfect for cleansing and exfoliating the body. The perfect spa tool for achieving smoother, radiant skin.